Bee stings are a common problem, especially for those who like to spend time outdoors during warm weather. For some people, a bee sting is little more than a nuisance, and the symptoms go away soon. However, some people are allergic to bee stings, and especially if they have been stung by more than one bee, the reaction may be severe and potentially life-threatening. When a bee stings, it inserts its venom through the skin, and the venom affects skin cells and immune system, causing pain and swelling. In people who have bee sting allergy, the venom can cause a more severe immune reaction. Sometimes bees leave their stinger inside the skin after they have attacked. The stinger must be removed immediately, otherwise it will continue to inject venom and cause the symptoms to aggravate. The stinger can be removed with tweezers. After the stink, the skin will start to turn red and swell around the sting site, which will turn red. A small white spot will appear at the place where the stinger went in. In most people, these symptoms go away after a few hours. An allergic reaction can be mild or severe. 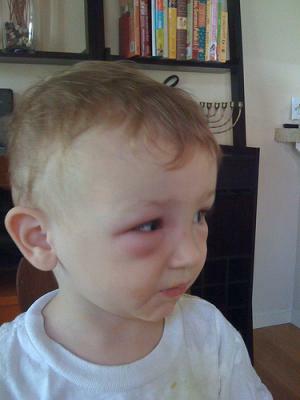 Severe reactions usually start immediately after the bee sting, but it is not rare for them to start a few hours or even days afterwards. This is why, a person who has been stung by a bee must be cautious and monitor his or her reactions during several following days. Also, it is possible for people who only had a mild reaction to bee stings to suddenly develop a serious allergy. The symptoms of an allergic reaction may include great swelling or edema at the part of the body where the bee stung, hives or itching of the entire body, wheezing, coughing, shortness of breath and chest pain. The symptoms which indicate a severe reaction include dizziness, confusion, fainting, vomiting or upset stomach. Anaphylaxis is the most severe form of allergic reaction. It is potentially life-threatening and requires urgent medical attention. Symptoms of this medical emergency include hives, flushed or pale skin at the parts of the body that have not been stung, swelling of the throat and the tongue that may interfere with breathing, rapid but weak pulse, nausea and vomiting, fainting and unconsciousness. Generally, it is advised to seek immediate medical assistance if the reaction includes symptoms like lightheadedness, difficulty breathing and swelling. Some people already know that they have bee sting allergy and they usually carry an autoinjector of epinephrine, which can save their life. If I'm allergic to wasp stings, am I allergic to bee stings also? I'm allergic to bees and yellow jackets. Allergic to wasps? Can I eat a bee honey if I'm allergic to bee stings? Could wasp sting be fatal in some cases?